The last nine months have been a real nightmare when it comes to my skin. With my pregnancy my skin was completely messed up... one day it was dry and flaky, the next it was oily and continuously producing shine, and red patches in certain areas on a daily basis. I gave birth to my daughter a couple weeks ago, and my skin is at the stage where it looks a little confused! It's time for a little TLC at home... that's if my little angel will actually give me time for some. I recently came across the company Refresh Skin Therapy, and was excited to test out two of their products. 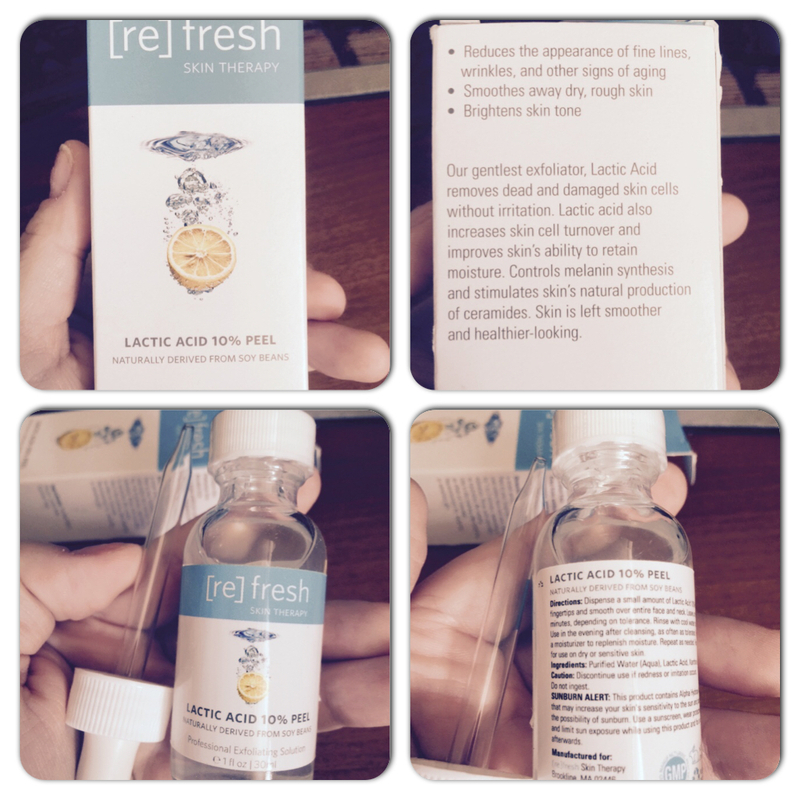 The first item that I tested out was their Lactic Acid 10% Peel, which left my face feeling refreshed like I spent a day at the spa. Just apply this to your clean face and let it do it's magic... it left my skin feeling smoother than before, and a healthy glow. What I noticed most, was that this helped my psoriasis around my eyebrow and hairline areas. This product exfoliates the skin, and contains Lactic Acid, which helps remove dead skin cells, and helps the skin retain moisture. So basically, your skin will start to feel like a babies bottom after multiple uses of this! 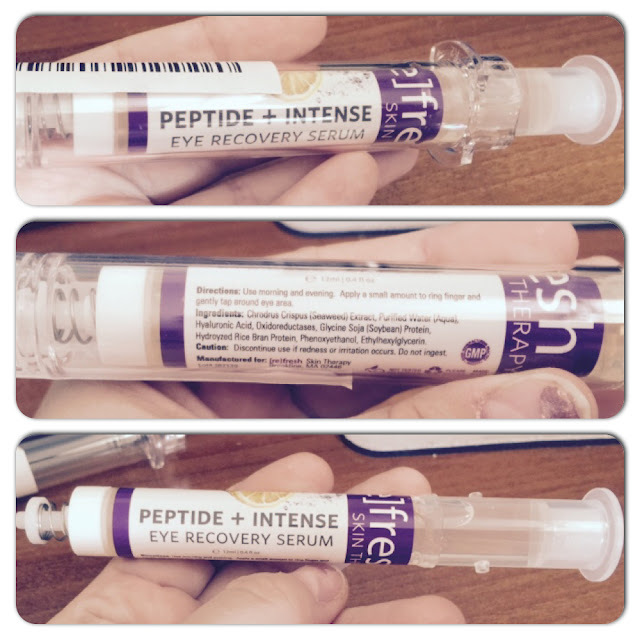 The second item that I tested from the company is their Peptide + Intense Eye Recovery Serum. This is by far my favorite of the two products... super funky packaging, and an awesome product for wrinkles in the eye area. This baby glides on super smooth, just a few dabs around each eye does the trick. It's lightweight, non sticky, and leaves the eyes feeling refreshed. I use this in the morning and at night before I go to bed... it helps relieve the puffiness when I'm tired, and smooth the fine lines. [re]fresh Skin Therapy was created to put time in a bottle. Their products can’t take you back to the time of the pyramids, but they can keep you from looking like you were there. Those little bottles of time are also time saved: getting you professional results on your schedule and without a trip to the dermatologist. Created in 2013 by a team from Boston with a combined 30 years in the beauty industry, [re]fresh Skin Therapy’s philosophy is real results from highly effective therapies which are safe and natural, for healthy skin. Their goal is to use only environmentally-friendly products and business practices whenever possible. Their products are produced in the USA using state-of-the-art equipment at a climate controlled, FDA-registered facility operated using cGMP (Certified Good Manufacturing Practices). They regularly conduct stringent quality control tests to ensure high-quality and safe products. Some of the tests include: pH balance tests, Viscosity tests, Appearance (aesthetics) tests, Odor tests, Microbial tests, Stability tests and Selective Heavy Metal tests. They use USP-grade ingredients which are all botanically-derived; they never test on animals or use animal-derived ingredients. The products are always free from Parabens, Perfumes, Dyes, and Phlalates. Come to Bob the Robber 2 | kizi 2, you will have the opportunity to discover thousands of the hottest games in the world with many genres such as action games, puzzle games, strategy games, fashion games or racing games. Click now!